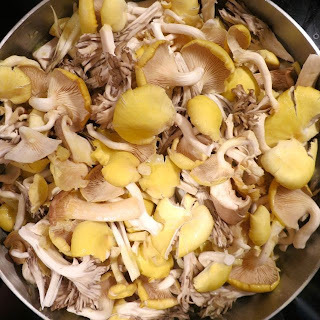 With a bounty of mushrooms collected during my trip to the mushroom festival, I made a delightful Wild Mushroom and Vegetable Fricassee! 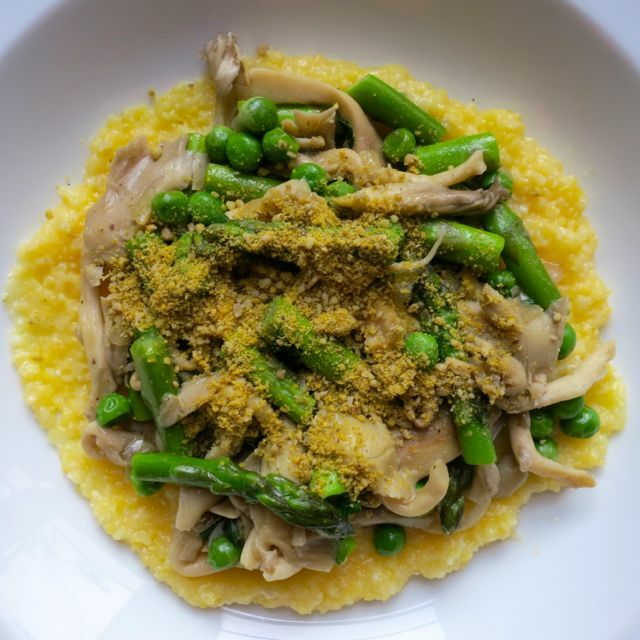 Served over freshly made polenta, you find fresh asparagus and wild mushrooms sauteed in Earth Balance Garlic & Herbs spread and high-quality olive oil topped with Parma vegan parmesan. Yes, it is as good as it sounds. 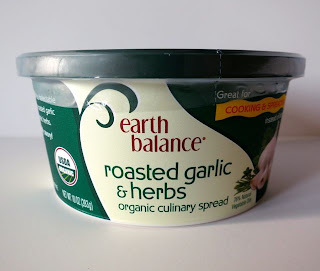 And actually this was the first time I ever used the Earth Balance Garlic & Herbs spread. I think it has great flavor and seems to be the perfect spread for sauteeing fresh veggies. I may be switching over to using this specific spread more often. 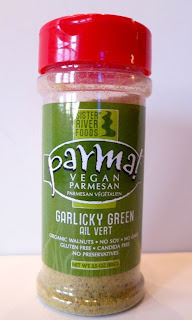 And I just happened to have a new container of Parma vegan parmesan in Garlicky Green, which was the perfect topping for this dish. Try it for yourself! To make the polenta, bring 6 cups of water to a boil. Add corn grits slowly while stirring. Reduce heat to low and stir often until thickened, about 20 minutes. Remove from heat and stir in vegan butter. Heat olive oil and spread in a large saute pan over medium-high heat. Add the garlic and shallots and saute for 2 minutes. Add the flour and heat until thickened, stirring well, about 2 minutes. Add the wine and stir. Add the mushrooms and cook, stirring regularly, for about 5 minutes. 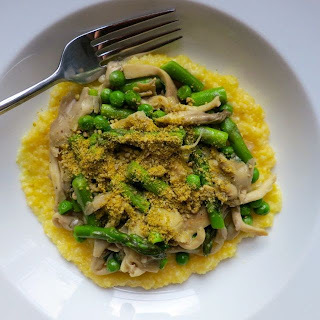 Add the asparagus, peas, parsley, thyme, sea salt, and black pepper and cook, stirring regularly for about 7 minutes, until liquid has evaporated and asparagus is tender, but not overcooked. 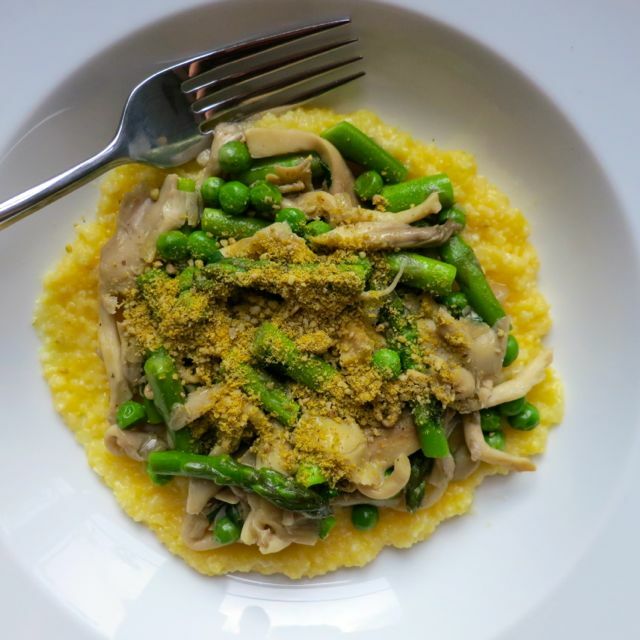 Serve vegetables over polenta with Parma vegan parmesan sprinkled on top.